The Katusha team has yet to deliver the results that match its ambitions and its budget. Joaquim Rodriguez and Denis Galimzyanov have had some good wins but for me the most fascinating aspect of the team is the network of people who stand behind the squad. This is a tale of secret agents, oligarchs, oil and gas, presidents and prime ministers as well as pro cycling. It is like no other team. Let’s go to Dresden in the late 1980s. Once the capital of the Saxony and a vital city filled with wealth and baroque architecture, Dresden was razed to the ground in 1945, it was a key military target but the controversial British carpet-bombing was also an attempt to demoralise the citizens. The war over, Germany was partitioned and Dresden’s misfortune continued, it was stuck behind the Iron Curtain and became a dull city in East Germany. Reconstruction brought concrete buildings, uniform and utilitarian and this was deliberate, partly to save money but the new communist rulers wanted to slip the city’s bourgeois past. But this is not a tale of architecture. Instead it concerns two buildings. The first is a drab rectangular block of flats, the grey concrete darkened by coal soot. The next is a villa on Angelikstrasse, number 4 to be precise. Because these buildings were the home and office respectively of two secret agents from the KGB, Russia’s intelligence agency. Their names: Sergey Chemezov and Vladimir Putin. You must be familiar with Putin, he is the Prime Minister of Russia and probably the world’s most powerful man. President Obama has too many pesky checks and balances; Chinese Premier Wen Jiabao is a cog in a party machine, albeit a large one. Chemezov too is powerful, more of him soon. Tracking the activities of KGB agents is not the simplest of tasks but a range of literature suggests Putin and Chemezov were neighbours both involved in recruiting informants, whether from the local technical university or within the numerous military research institutes in Dresden, a surviving aspect of the allied bombing. As the same time the Soviet economy was gradually collapsing and the need for hard currency became ever greater. Many exportable products were of inferior quality and subject to trade boycott. A new trade emerged: the export of sportsmen. The model was simple, the USSR had many champion athletes and topped the Olympic medal table whilst the Western world paid top dollar for sporting talent. An agency called Sovintersport was created to sit at the intersection of this demand and supply and earned money via the services of Soviet athletes. For example it brokered deals with boxing promoters, charging $200,000 per boxer (whilst the boxer themselves were lucky to take $900 a month). Similar deals saw ice hockey players sent to Canada and Switzerland. This practice extended to cycling. Italian firm Alfa Lum has been manufacturing aluminium windows and doors for many years and back in the 1980s it sponsored a cycling team that enjoyed moderate success. But a deal was done with Sovintersport and the best riders of the Soviet Union were dispatched to Italy in the late 1980s in exchange for an undisclosed sum. Suddenly the likes of Maurizio Fondriest found new team mates like Dimitri Konychev, Andrei Tchmil, Piotr Ugrumov, Djamolidine Abdoujaparov and others from a variety of Soviet nations. Chemezov, Putin’s old neighbour, was Deputy Director General of Sovintersport and some reports say he was placed there by the KGB, the agency was keen to oversee – and perhaps influence – the lucrative business. Chemezov and Putin’s path’s had separated, Chemezov was involved in this agency whilst Putin returned to his hometown of St Petersburg and soon popped up as a deputy to the mayor and some say he was placed by the intelligence services into this influential job. But the two were to reunite later. The Soviet Union was vanishing and opportunities arose for some. But amidst the chaos the secret police and intelligence services remained a constant. The KGB itself was wound down but in the same building, Lubyanka – Moscow’s Scotland Yard if you like – was born the FSB and most of the old faces continued under the new initials. Chemezov and Putin’s careers took off. A native of Turkmenistan, Makarov was a poor boy who became a world-class bicycle racer, bringing glory to Turkmenistan and becoming a local hero. As a result he was befriended by the Turkman president, the President for Life or Turkmenbashi, as he called himself, Saparmurat Nizarov. After the collapse of the Soviet Union, Turkmenistan found itself with almost no convertible currency and as a result, in serious need of basic consumer goods. Through his friendship with Niyazov, Makarov was given access to Turkmenistan’s natural gas, which Makarov was then allowed to use to barter for food and other consumer goods. Gas was available in vast quantities but getting out of the country and moving to where it was wanted was another matter. Makarov set up a business called ITERA with two others and then agreed a deal with Russian gas company Gazprom, today one of the world’s largest energy companies. But Gazprom was not interested in Turkmen gas, after all Russia has vast reserves and fresh supply would only have driven down the price. But Ukraine needed gas and was prickly towards Russia, understandable given it had been under Moscow’s control during the Soviet era and was now trying to re-emerge as a nation its own right. Makarov struck a deal to export Turkmen gas via Gazprom’s pipelines straight to Ukraine. ITERA hit the jackpot, selling gas to Ukraine and other countries in exchange for cash and even bulk deliveries of cereals, sugar and meat. Makarov went from selling denim to a key player in the world energy business and earned untold wealth. He bought a mansion in Jacksonville, Florida and re-registered ITERA’s corporate HQ to the US, in hindsight a clever means to ensure his money was safe in the Western system and beyond the reach of any political turmoil in the old Soviet states. Since it was created ITERA, like many a Russian energy company, has been a mystery when comes to determining ownership and control. In fact ITERA has over the years been a partner, owner, rival and subsidiary of Gazprom. The late 1990s were fast and loose times. Gazprom barely paid any tax and this leniency saw it become the fiefdom of its executives. During the maelstrom Rem Viakhirev, then boss of Gazprom, cut several deals with Makarov and ITERA in what Marshall Goldman describes as “asset stripping” and indeed ITERA went from being a mere gas trader to an energy giant, acquiring oil and gas fields in odd-looking dals. “Almost all the trustees of ITERA seemed to be close relatives or mistresses of senior Gazprom executives” writes Goldman. An example of this was Purgaz, which controlled hundreds of billions of cubic metres of gas and ITERA acquired one third of this for $1,200. A sum more normally associated with the annual heating bill for a good sized house than a prolific gas field. Fast forward to 2000 and Putin became President of Russia, a long way from the drab Dresden flat. One of his first acts to rein in the new oligarchs who controlled so much of Russia’s natural resources – as well as more sinister figures who lurked in the shadows. Gazprom was a prime target. Putin ejected Vyakhirev and in came Dmitry Medvedev and Alexei Miller. Today Medvedev is President of Russia today and Miller is boss of Gazprom. Whilst some oligarchs enjoyed protection from Moscow, others were imprisoned, for example Mikhail Khodorkovsky and Platon Lebedev. Makarov seems to have found a fortunate middle route. ITERA was made an offer it could not refuse for the assets it had once acquired from Gazprom. Just as it had acquired the assets at a eyebrow raising discount, it was now forced to return them for a knockdown price. Wisely Makarov and ITERA complied. During this time Putin’s old neighbour Sergey Chemezov was enjoying rapid career progression. Sovintersport vanished but Chemezov emerged as the director of Promexport, a state-owned arms export business that merged in 2000 to become Rosoboronexport. Chemezov runs this today, a crucial job in Russia. Rosoboronexport has the monopoly on defence technology exports, in other words it takes a percentage of every aerospace and arms deal and has strong-armed companies like jet fighter aviation company Sukhoi into accepting this control. In recent years the US has sought to thwart Chemezov and Rosoboronexport after dissatisfaction at Russian arms sales to the likes of Venezuela, Syria and Iran but the tune has since changed and these days the US is buying helicopters from Russia. In fact Chemezov has become even more powerful as he heads another venture Rostechn, known in English as Russian Technologies, a sprawling holding company that owns stakes in a wide variety of Russian companies across the defence, aerospace, technology and automotive sectors, for example it supplies Boeing with titanium forgings for the new Dreamliner aircraft and is working with Renault. The careers of Vladimir Putin, Sergey Chemezov and Igor Makarov have been examined – albeit briefly – and along the way people like the cyclists Piotr Urgumov and Andrei Tchmil have cropped up, as well as Alexey Miller, the boss of Gazprom and Dimitri Medvedev, the former Gazprom executive who is now President of Russia under Putin. How does all of this relate to Katusha and Russian cycling? the well-connected Sergey Chemezov is the chairman of the board at Russian Cycling too and his Rostechn empire is a sponsor of the team. Unlike the days of Sovintersport, these days Chemezov imports Europeans to ride for a Russian team. And his wife Iganatova reportedly owns 5% of ITERA. Igor Makarov continues to run ITERA whilst he is also President of Russian Cycling and the boss of the Katusha team, which is sponsored by ITERA. Makarov is also now a senior official at the UCI – where he finds time, I don’t know – after he was elected by the European Cycling Union, an umbrella group of European Cycling Federations, to serve on the UCI’s Management Committee. Weeks before being elected, ITERA generously poured money into the ECU and, lo, Makarov was voted in. Another sponsor featured on the Katusha jersey is Miller’s Gazprom, without doubt Russia’s most important business and Miller is closely-tied with the Russian government. Together Chemezov, Miller and Makarov are the trio who run the Katusha team’s supervisory board. In short this is team Kremlin. There are parallels with the Astana team, the Kazakh squad exists to showcase the oil-rich nation and sprinkle celebrity on its leader. But arguably the team is a vehicle for Alexander Vinokourov and above all, Astana simply doesn’t have the same clout lined up behind it. From 1980s Dresden to Moscow today, Putin and Chemezov are siloviki, a Russian word that roughly translates as “figures of power” and relates to the those who have risen from the security services. Makarov and Miller form part of Putin’s komanda, his inner circle. Some of these people were involved with Russian pro cycling in its earliest days with the Alfa Lum team. Today the people behind the Katusha team are the same people who behind Putin. By definition Putin stands behind the Katusha team. Makarov in particular has had an amazing career. From world-class track cycling to selling jeans, then becoming a crony of the Turkmen president and onwards to gas sales in Ukraine and surviving allegations of asset stripping and his Florida business being investigated by the FBI to becoming a close associate of the Putin government. He’s made some enemies along the way but always kept close to powerful protectors. He’s also a senior figure within the UCI now. Nobody else within the governing body has the same wealth, connections and influence. The “Russian global cycling project” wording on the jersey, team bus and website is not a slogan, it is a statement of fact. These billionaire oligarchs, with vast wealth and power, curiously run a cycling team. Just as the Soviet Union once sought sporting success, Moscow is today aiming for similar glory. Cycling is a chosen sport but there are others, the 2014 Winter Olympics are another part of this impressive spend and Katusha even sponsors a sailing team, making it surely the first cycling team to be a sponsor, rather than sponsored. And note the overlap between the state and sport, for example the Russian intelligence services knew a week in advance of the announcement that Russia would host soccer’s 2018 FIFA World Cup. The pro team is just one part of Russia’s spending on cycling, there is the Itera-Katusha development team and Pro Continental team Rusvelo too. With a man in the UCI it can only be a matter of time until Moscow gets a World Tour race and if the Putin komanda retains power for long enough, we can probably expect the World Championships there before 2020. Some teams sell flooring, banking or satellite television. Katusha sells Russia. This is a team like no other. What a web they’ve created. Katusha as a team have never appealed to me, now I know why. Great story! Makes the machinations involved in USA Cycling pale in comparison though corruption is corruption, whether it’s there, in Russia or at the UCI. You can’t make this s__t up, reality is just too good to need embellishment. On the bike end, I remember rumors about how many Colnagos with Campagnolo parts on them had to be traded to the Russians to get these riders for Alfa-Lum? A very good piece. Reminded me of an article by the BBC not long ago. Interesting to see where the funding and subsequent interest ends up, track or road cycling, I guess its the same vehicle for Itera/Gazprom. Amazing stuff and a great piece of journalism! Its so much better (and harder) to write about real life behind sports than reviews of freebie jackets or blogs about articles about twitter. Good article, please make more like these. It´s the stories from within the peleton and the stories behind the cycling that make INRNG so good. Brilliant. I read it once, then read it all again. With so many big guys connected to the team, it’s amazing they’ve not achieved more. Kinda makes them look bad. Glad to see so many are enjoying it. A longer read than usual, I wondered if people would be patient enough to read it. I could write something ten times longer, there’s a lot more detail and information, skipping through 20+ years of history means leaving a lot of stories, anecdotes and titbits out. Larry T: I don’t know if it’s true… but Chemezov was also into wintersports via Sovintersport and as well as Colnagos, apparently got plenty of skis. His old friend Putin liked skiing and got the best material from the west via Chemezov and in time Leonid Tyagachev, Sovintersport’s winter sports man, rose to become head of the Russian Olympic Committee in return. Jeff: luckily results don’t come from spraying money around. Team Sky does spend but a lot goes on coaching and forming a team unit. But yes, the team does not look good. We’ll see what new manager Holczer does in 2012, I feel he could be like a soccer manager who might face the sack if he doesn’t deliver results immediately. Talking of making the “big guys” look bad, I left out the recent tale of Kolobnev apparently selling Liege-Bastogne-Liege to Vinokourov. Knighed by the Russian President and even cleared of a doping positive, Kolobnev was an asset to the team. But Katusha was moments away from its greatest win and a deal might have been done. Worse, the win went to Vino and his oil-sponsored Kazakhstan team! In mild terms, this was letting the side down. An excellent piece, thank you for something so interesting – and so unlike most cycling journalism. I also read it twice. I used to think that Dave Brailsford was all-powerful but he doesn’t even come close! Well, the practice of having senior govt officials in key positions of state sporting associations in not really new or unique in most parts of the world, and doesn’t necessarily imply a darker side to the sport, as this article seems to indicate. Inrg – BCCI, which is probably more powerful than the ICC, is headed by senior and former politicians, who’ve been in charge of a bunch of other things, including defense deals, etc. Doesn’t mean that the cricket fellows are out there stealing State secrets from Lords. As for “selling” wins, correct me if I am wrong but that is a pretty common practice in European racing, especially by guys who know they are not likely to win the bunch sprint anyway. I fail to see the big deal about it. The “sanctity of the sports” guys don’t get so upset when a GC rider lets his breakaway partner get the stage win – same concept. And re Team Sky – one possible reason they don’t do so well is b/c the riders are not that great. I really like Flecha as a rider (and not just b/c of that absolutely awesome namesake victory salute), but his days as an elite Classics rider are pretty much over. Wiggins is overhyped – Cycle Sport actually had wrote “forget Contador and the Schlecks, could 2012 be the year of Evans, Wiggins and Froome” (a bit of cycling idiocy which finally got me to cancel my subscription to them). And this about a guy who came 3rd in the Grand Tour with the weakest complement of riders, and who has never shown he can hang with the big dogs on the climbs. Boasson-Hagen is a good rider and could probably win more than Wiggo, but won’t have the team support. Having Cav will help but I predict that his win total will be a lot lower without the HTC train helping him along. He’s gonna get boxed in more, the train’s gonna get derailed more, etc. Which is a bit of a shame, as I was finally starting to warm up the fat little kid. Generally, I find Sky and Lay-O-Pard-Trek-RandomCar to be the two most annoying teams in the Pro Tour, mainly because of the smugness emanating from them. Lay-O-Pard won fuckall without Riis’s acumen, and were reduced to Cancellara whining yet again that the other guys didn’t help pull me to the win. Sky is always about “next year, next year”. The team I am most excited about for this year is Omega-Pharma-Lotto-Silence-Quick Step-Dirk’s Motorhomes-Other Belgian Company. Reading this in nov 2013 makes me smile! Guadzilla – tell us, did you eat humble pie and renew your subscription to Cycle Sport? Is there a piece on Murdoch next, please? Similar story to how Roman Abramovich escaped with his laundered ill gotten gains to buy Chelsea Football club in the English premiership league. Actually had a discussion with norwegian Kristoff on his choose of team Kathusa their relevance to russian mafia and pretend anti-doping as I call it, he couldn’t believe why I had so many negativ feeling about his pick… i wonder if he is not caring or not knowing? Maybe this explains this years Karpet Bombing of Contador in the TDF? I wonder what was going on there? Great article though, with lots of insight that you dont normally see. Good job. This post reminds me why I love The Inrng! Great job! Sounds like you could write a book on this subject. Within hours this has become the most read story of the blog in 2011, it seems to be going well beyond the usual crowd of cycling fans. I’d sat on the story for some time thinking that whilst I found the subject fascinating, many would find tales of Soviet gas supply and Russian politicians a snooze. Besides, the above version is over 2000 words, much longer than usual and I thought it was too wordy (a lot of detail got left out, I might consider a “directors cut” version). There should be more on this and related stories for 2012. Wow, this even puts the UCI and McQuaids to shame. Thanks, inrng! Gr8 read! Your site ranks up there with Peloton mag et al! Quality in-depth journalism! Looking forward to more in 2012! Best Wishes for the New Year! This a great article, makes you think what the hidden agenda is and if the team is a front for some thing dodgy… Please can we have an extended version! This is a very interesting piece that touches on so many issues, from the Katusha team out to the wild deals of the energy sector made in a variety of ex-Soviet states to energy policy in Europe today. – It is no exaggeration to state that Ukraine today is in danger of prolonged political crisis, in part because of organized crime and feuding over gas contracts. – Some named above are prime causes of the Orange Revolution and the subsequent fall out. – Witness Naftogaz Ukrainy that turned a commercial dispute with Gazprom into a political crisis, prompting fears of energy security across Western Europe in 2006. – Moscow’s international reach is a more function of its oil and gas asset base than its nuclear weaponery. – Against this the cycle team seems irrelevant yet it sees some of the most powerful people in Russia for once in a direct link, instead of passing via Putin and the security services. The surprise is that Putin, a sports fan and lover of the great outdoors, is not on the team. I report on the oil and gas sector in Europe, email me if you would like to discuss more. Very interesting read – just one tiny question: How do you know that the Russian security services knew about the football world cup decision a week before the announcement? Blimey, very good read. No wonder the UCI’s unmovable by normal humans when it’s got geezers like that on the board! Well, the whole “Putin-KGB-join-the-dots-saga” might sound interesting to western people, but no big deal for us ex-Soviets. The so-called “dashing 1990-s” were extremely violent and competitive in terms of selling/capturing every bit of USSR heritage – that’s called “Russian capitalism” in its initial phase. So there are no unshaded characters in business, and lightspeed careers were usual. In Soviet Russia, gas buy YOU!! If you follow recent Abramovich vs Berezovskiy trial in London, you might have already learned all this “siloviki” and “krysha” slang. Some Sovintersport deals were like this – first Soviet football stars (Aleinikov and Zavarov in 1989) were transfered to “Juventus” for the only reason – long-term business partnership between Fiat and AvtoVAZ. Or so I’ve read. Gazprom sponsors Zenit (St Petersburg), Schalke 04 (watched biathlon in Gelsenkirchen yesterday? You are closer to Mafia now. Surely, not so close as Kristoff, but still), Crvena Zvezda, two russian ice-hockey clubs, chess tournaments (recent Tal Memorial for example – one of the best in history, if not the best) and I believe dozens of something else (Bavaria, eh?). So personally I appreciate investing money in cycling and chess as my favourite sports, hehehh – which are somewhat struggling, by the way. Concerning results – oh well, Katusha’s not a powerhouse anyway, like that Shack or BMC or Leopard ones. Karpets into Space, somebody? Pff. And not that aggressive transfer strategy – actually Sky bought Swift’s contract out of Katusha, IIRC. The idea is not to go Chelsea, but to win by pure russian KGB-proved blood, like Ivanov in Amstel Gold. So the success of farm Itera russian-only squad is more important, IMHO – 10th place in UCI European Tour, ahead of Geox, Acqua, Rabo CT etc, being only conti – thats ok. Yeah, UCI rankings are somewhat quirky, I know. 2. You MUST fear Katusha. Really. Because – maybe you don’t know – the team is named after rocket launcher. Here it is, my preciousss! Wikipedia may also tell you it’s russian diminutive form of Catherine, but don’t get fooled – Makarov was quite unambiguous like “We could name it Gazprom-Itera or Gazprom-Rostechnologii, but finally thought of something truly Russian and truly formidable.” No, it’s not Catherine. Rocket launcher is not the worst thing to fear, I’d say. Better, than Liquigas or Agritubel. Typos: Chemenezov – couple of times, Nazirov – once, Ignatova – not Iganatova. Let me offer the suggestion that when making such outlandish statements it’s best and therefore most accurate to use the word, arguably. “Probably” doesn’t cut it when – in this case – the PM is leading a former empire crumbling into ruin, and becoming a laughing stock of the world. Russia, with it’s outdated military system, disloyal public servants, and poor economy — is no longer a powerful nation, so it stands to reason that the leader cannot be the most powerful in the world. Moreover; the country has alienated so many of its former Bloc countries that the massive bargaining chip it held in its back pocket against Hitler, the Ukrainian wheat fields, is no longer a prize they can dangle in front of a world slowly heading toward a future where wars may occur on the basis of food security. Russia is a joke country, the leader about as powerful as the PM of Canada. In addition; I don’t remember that George W. Bush was fazed by these apparent “checks and balances”. There is no doubt that President Barack Obama is arguably one of the most powerful men in the world, although the Roman Pontiff, through the alleged association in the Rothschild banking dynasty in what can be accurately and more deeply described as Rothschild Zionism — is another leader who can be regarded as such powerful men in the world. recruiting informants, but the KGB needn’t have placed Chemezov at Sovintersport would have been an agency which the country would have been benefitting from and its interests would have been reliant on KGB assistance. It is the same in the USA with selling Coca-Cola and McDonalds (toaster ovens in a le Carre work), the CIA are involved to find and stabilize markets in foreign countries for these products. The KGB, would have cultivated networks for Sovintersport, but it is laughable to suggest that they would have needed a man on the ‘inside’ – they were on the inside of the entire nation, we’re talking about Communism, no? Makarov’s “middle route” was “fortunate” in so far as he was willing to not be greedy and make a fuss, as you say he was smart to relocate to the USA. So in this case, fortune favoured the malleable, Makarov wasn’t under the misinformation that Russia was a democracy, and had free and fair functions. If he was, he would have ended up like Mikhail Khodorkovsky, no doubt. In conclusion; you raise the title for this story from a 1974 British spy novel by John le Carre, forming all these sinster associations which are inferring some grand conspiracy with corruption as its centrepiece, but failing to support any of it with evidence. If you were going to borrow a title from le Carre to bastardize into your version, a better prospect who have been Constant Gardener (Constant Cyclist) – as this is the way business has been done in this world since the medieval days, from whence we get the word “Machiavellian” for instance. Yes, I agree with you, “Katusha sells Russia”, making it a distinctive team in professional world cycling, however, to infer that it is selling corruption since Russia is presently regarded as a failed-democracy and a corrupt state — is the height of tabloid journalism and worthy of only a cursory read, making reading it twice a severe waste of time. A piece essentially failing in many of the aspects of important and good investigative journalism, and again showing why blogs will always be inferior to mainstream news services – the authors haven’t been schooled in the press. bubnoff: yes, I tried not to sensationalise this, I was more trying to point the connections to readers, no other team in cycling has quite the same connection to heads of state and can partially trace its history to the secret services. The Itera (now Rusvelo) team is one to watch, they won more races in 2011 than Katusha; they’ll be frustrated to lose Novikov to Vacansoleil. And the Katusha rocket… is named after a patriotic song, right? Great story, very interesting comments for the most part. Keep up the good work. The connections between the Russians and Italians are interesting too….a lot of interconnected relationships with organized crime in both countries I suspect. As you pointed out I wonder if Holczer knows what he’s getting himself into with these folks? I agree with Guadzilla on the teams he mentioned though I would like to see Vicenzo Nibali do well in 2012, despite being on Liquigas with Ivan “Boring” Basso. Really inrng, what makes you different from myriads of cycling blogs out there is SUBSTANCE. Few people on the net now can actually bother to write anything more than 300 words and that’s a stretch. Substance simply cannot come with such limiting figures. People really do appreciate reading well-researched and written story. You are amazing with writing, none of your blog posts fail to entertain AND educate me and I believe many readers about the sport we love. More of this please! I always thought cycling would make a great espionage cover with its global reach and indigenous access. As far as money and performance, there can be a relation but then there’s always stories like the one related in Money Ball. I have never thought of Russia as a failed democracy-at least not in the terms I think of democracy. One vote one party? Secondly. I rarely (once a year?) read a solid piece of mainstream journalism. Welcome to 2012. Can of worms comes to mind, of course gangsters and politics have both been intertwined with sport from the beginning. I keep on coming back here for just this type of insight and the comments produced. Bring on the director’s cut inrng! Like bubnoff I’m also interested in Oleg Tinkoff’s role in the story. This review from the LRB explains the present day shambles of Russia very well, I think. More good work, Inrng. Thanks. Agreed Katusha are a team that are hard to warm to, starting with the military origin of their name. Great read. Thanks. Before we all get squiffy about the murky role of Russian business and the state in bed with sportsmen it is wise to remember such things as the CIA/Coke association as previously mentioned. That UK and US business have allowed themselves to be intimate players in geopolitics, including sports, is a fairly open secret. But worth reminding ourselves about. Sadly, money corrupts. schnitz – a one vote one part democracy is an autocracy by any other name. See the pattern… one vote, one party, one person with all the power? Ha-ha! You can think of Russia in any way you like mate, however the recent and widespread voter dissatisfaction post election speaks volumes of the failure of their democratic system, to those paying attention. TotheBillyoh – I tend to think it is even more difficult to warm to them after reading such a narrow and one-sided piece as this le Carre inspiration. Steve – Oh! thanks for the link. Ace stuff! Great piece, would love to read more about Sovintersport. I have just been to the Team Katusha website, and the sponsor page looks completely different after reading this article. Among the “gold sponsors” are Gazprom, Itera, Rostech, Novikombank (its website is interesting, Chemezov is the chairman of the board and Rostech, Itera and Rosoboronexport are partners of the bank). And this article makes me think about one more question, why is Katusha based in Italy? A team runned to sell russia, by the president of the russian cycling federation, that seems odd to me…. jasus does Pat know all of this? Far away: Italy is a good place to be based. But they are there for two reasons, first the team has its roots in the Tinkoff team and Oleg Tinkoff decided on Italy, the team management was Italian, eg Serge Parsani. Second, they now have a giant new logistics base (“service corse”) near Lake Garda, a stone’s throw from Igor Makarov’s lakeside villa. But whilst they have operations in Italy, they are in fact based inside a watch factory in Switzerland. See http://inrng.com/2010/08/katusha-diamond-watches/ for more, another odd read. >> And the Katusha rocket… is named after a patriotic song, right? Inrng, it’s a nickname after all so it’s hard to figure exactly, but it’s one of the versions indeed. Saying the team was named after rocket launcher I was somewhat “Fear all-mighty Ruskiz!”-ish because I’m Russian myself, hehehh. “Katusha” really is polysemantic – girl’s name, patriotic song and this military thing. The rocket itself has very positive image, it helped greatly in WWII, we have monuments here and there – so its no way “Team Kalashnikov”. So the name is patriotic for Russian speakers and rather catchy for the rest of the world partly thanks to exclusive cyrillic letters “Ю” and “Ш” – close to ideal, I think. Happy New Year, Inrng! I enjoy your articles greatly, thanks. Got a nice link on the Guardian page. Are you sure RusVelo is Katusha’s development team? Is Itera – Katusha no more? RusVelo is Pro Continental and is born out of the track program (I think). Wouldn’t there be some issues if RusVelo were indeed Katusha’s feeder team, they wouldn’t be able to compete in the same races (and RusVelo being Pro Conti would be aiming for some bigger ones). RusVelo is probably backed by RGCP in some way, but if Itera has folded and they now consider RusVelo as Katusha B, technically wouldn’t they still have to operate “independently” of the parent squad, if they want to race together (recalling the GRM/CDT and RSH/TLS problem last year)? An update on my last comment, I found some answers. (3) Despite (2), RusVelo is independent of the Katusha organisation (at least technically, whether we believe it or not is irrelevant). Excellent piece. 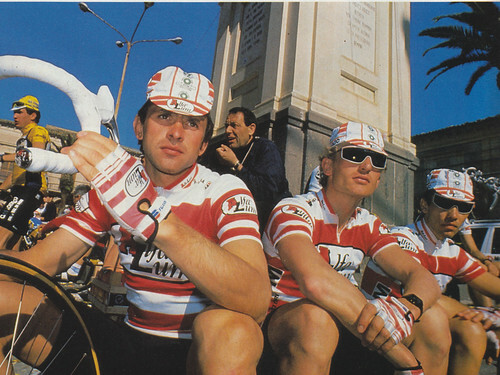 As a slight correction, Fondriest moved to Del Tongo for the 1989 season before the Soviet riders arrived. He was later teammates with at least Ugrumov on the Roslotto team. Carre back – take care! It sounds really interesting. I am following Russian cycling and all about this in mass media very carefully, but I have to say I had no idea about close ties of Russian cycling with Kremlin. How did you find out it all? Sounds totally scandalous. Nice read, but what’s not addressed (unless I missed it) is, with all this money and power, why was Katusha caught flat-footed on the announcement? If Makaraov is a member of senior management at the UCI, how does this happen? It’s simultaneously a slap on the Russian’s face and an episode that reveals a lot about how the UCI is run. If a member of senior management is not aware of who is in and who is out, how are these decisions made? That’s a more interesting story to me than the oft-told story of Russian oligarchs. As a new reader of Inner Ring, I didn’t know about this until I read your (excellent) review of the Land of Second Chances book today; naturally enough I followed the link and Jeez, am I glad I did. What a great article, I didn’t think writing that like this happened anymore. Gonna have to go back and read it again. PS – Are you sure that the secret services knew Russia had won the 2018 World Cup in advance of the vote? Does the (British) FA know this?